Dear Mr. Tesla, I am pleased to hear that you are celebrating your 75th birthday and that you as a successful pioneer in the field if high-frequency currents, the wonderful development of this area of technology have allowed to experience. I congratulate you on the great success of your life's work. Albert Einstein (/ˈælbərt ˈaɪnstaɪn/; German: [ˈalbɐt ˈaɪnʃtaɪn] ( listen); 14 March 1879 – 18 April 1955) was a German-born theoretical physicist. He developed the general theory of relativity, one of the two pillars of modern physics (alongside quantum mechanics). He is best known for his mass–energy equivalence formula E = mc2 (which has been dubbed "the world's most famous equation"). He received the 1921 Nobel Prize in Physics "for his services to theoretical physics, and especially for his discovery of the law of the photoelectric effect". The latter was pivotal in establishing quantum theory. He was visiting the United States when Adolf Hitler came to power in 1933 and did not go back to Germany, where he had been a professor at the Berlin Academy of Sciences. He settled in the U.S., becoming an American citizen in 1940. On the eve of World War II, he endorsed a letter to President Franklin D. Roosevelt alerting him to the potential development of "extremely powerful bombs of a new type" and recommending that the U.S. begin similar research. This eventually led to what would become the Manhattan Project. Einstein supported defending the Allied forces, but largely denounced the idea of using the newly discovered nuclear fission as a weapon. Later, with the British philosopher Bertrand Russell, Einstein signed the Russell–Einstein Manifesto, which highlighted the danger of nuclear weapons. Einstein was affiliated with the Institute for Advanced Study in Princeton, New Jersey, until his death in 1955. The Einsteins were non-observant Ashkenazi Jews. Albert attended a Catholic elementary school from the age of five for three years. At the age of eight, he was transferred to the Luitpold Gymnasium (now known as the Albert Einstein Gymnasium), where he received advanced primary and secondary school education until he left Germany seven years later. Contrary to popular suggestions that he had struggled with early speech difficulties, the Albert Einstein Archives indicate he excelled at the first school that he attended. He was right-handed; there appears to be no evidence for the widespread popular belief that he was left-handed. In 1894, his father's company failed: direct current (DC) lost the War of Currents to alternating current (AC). In search of business, the Einstein family moved to Italy, first to Milan and then, a few months later, to Pavia. When the family moved to Pavia, Einstein stayed in Munich to finish his studies at the Luitpold Gymnasium. His father intended for him to pursue electrical engineering, but Einstein clashed with authorities and resented the school's regimen and teaching method. He later wrote that the spirit of learning and creative thought were lost in strict rote learning. At the end of December 1894, he travelled to Italy to join his family in Pavia, convincing the school to let him go by using a doctor's note. It was during his time in Italy that he wrote a short essay with the title "On the Investigation of the State of the Ether in a Magnetic Field." In 1895, at the age of sixteen, Einstein sat the entrance examinations for the Swiss Federal Polytechnic in Zürich (later the Eidgenössische Technische Hochschule ETH). He failed to reach the required standard in the general part of the examination, but obtained exceptional grades in physics and mathematics. On the advice of the Principal of the Polytechnic, he attended the Aargau Cantonal School in Aarau, Switzerland, in 1895–96 to complete his secondary schooling. While lodging with the family of Professor Jost Winteler, he fell in love with Winteler's daughter, Marie. (Albert's sister Maja later married Wintelers' son Paul.) In January 1896, with his father's approval, he renounced his citizenship in the German Kingdom of Württemberg to avoid military service. In September 1896, he passed the Swiss Matura with mostly good grades, including a top grade of 6 in physics and mathematical subjects, on a scale of 1-6, and, though only seventeen, enrolled in the four-year mathematics and physics teaching diploma program at the Zürich Polytechnic. Marie Winteler moved to Olsberg, Switzerland for a teaching post. Einstein's future wife, Mileva Marić, also enrolled at the Polytechnic that same year, the only woman among the six students in the mathematics and physics section of the teaching diploma course. Over the next few years, Einstein and Marić's friendship developed into romance, and they read books together on extra-curricular physics in which Einstein was taking an increasing interest. In 1900, Einstein was awarded the Zürich Polytechnic teaching diploma, but Marić failed the examination with a poor grade in the mathematics component, theory of functions. There have been claims that Marić collaborated with Einstein on his celebrated 1905 papers, but historians of physics who have studied the issue find no evidence that she made any substantive contributions. Einstein and Marić married in January 1903. In May 1904, the couple's first son, Hans Albert Einstein, was born in Bern, Switzerland. Their second son, Eduard, was born in Zurich in July 1910. In 1914, Einstein moved to Berlin, while his wife remained in Zurich with their sons. They divorced on 14 February 1919, having lived apart for five years. After graduating, Einstein spent almost two frustrating years searching for a teaching post. He acquired Swiss citizenship in February 1901, but was not conscripted for medical reasons. With the help of Marcel Grossmann's father Einstein secured a job in Bern at the Federal Office for Intellectual Property, the patent office, as an assistant examiner. He evaluated patent applications for electromagnetic devices. In 1903, Einstein's position at the Swiss Patent Office became permanent, although he was passed over for promotion until he "fully mastered machine technology". In 1901, his paper "Folgerungen aus den Capillaritätserscheinungen" ("Conclusions from the Capillarity Phenomena") was published in the prestigious Annalen der Physik. On 30 April 1905, Einstein completed his thesis, with Alfred Kleiner, Professor of Experimental Physics, serving as pro-forma advisor. Einstein was awarded a PhD by the University of Zürich. His dissertation was entitled "A New Determination of Molecular Dimensions." This paper included Einstein's initial estimates of Avogadro constant as 2.2×1023 based on diffusion coefficients and viscosities of sugar solutions in water. That same year, which has been called Einstein's annus mirabilis (miracle year), he published four groundbreaking papers, on the photoelectric effect, Brownian motion, special relativity, and the equivalence of mass and energy, which were to bring him to the notice of the academic world. By 1908, he was recognized as a leading scientist, and he was appointed lecturer at the University of Bern. The following year, he quit the patent office and the lectureship to take the position of physics docent at the University of Zürich. He became a full professor at Charles-Ferdinand University in Prague in 1911. Also in 1911, corrections of algebraic errors in his thesis brought Einstein's Avogadro constant estimate to 6.6×1023. In 1914, he returned to Germany after being appointed director of the Kaiser Wilhelm Institute for Physics (1914–1932) and a professor at the Humboldt University of Berlin, with a special clause in his contract that freed him from most teaching obligations. He became a member of the Prussian Academy of Sciences. In 1916, Einstein was appointed president of the German Physical Society (1916–1918). During 1911, he had calculated that, based on his new theory of general relativity, light from another star would be bent by the Sun's gravity. That prediction was claimed confirmed by observations made by a British expedition led by Sir Arthur Eddington during the solar eclipse of 29 May 1919. International media reports of this made Einstein world famous. On 7 November 1919, the leading British newspaper The Times printed a banner headline that read: "Revolution in Science – New Theory of the Universe – Newtonian Ideas Overthrown". Much later, questions were raised whether the measurements had been accurate enough to support Einstein's theory. In 1980 historians John Earman and Clark Glymour published an analysis suggesting that Eddington had suppressed unfavorable results. The two reviewers found possible flaws in Eddington's selection of data, but their doubts, although widely quoted and, indeed, now with a "mythical" status almost equivalent to the status of the original observations, have not been confirmed. Eddington's selection from the data seems valid and his team indeed made astronomical measurements verifying the theory. Einstein visited New York City for the first time on 2 April 1921, where he received an official welcome by Mayor John Francis Hylan, followed by three weeks of lectures and receptions. He went on to deliver several lectures at Columbia University and Princeton University, and in Washington he accompanied representatives of the National Academy of Science on a visit to the White House. On his return to Europe he was the guest of the British statesman and philosopher Viscount Haldane in London, where he met several renowned scientific, intellectual and political figures, and delivered a lecture at King's College. In February 1933 while on a visit to the United States, Einstein decided not to return to Germany due to the rise to power of the Nazis under Germany's new chancellor, Adolf Hitler. He visited American universities in early 1933 where he undertook his third two-month visiting professorship at the California Institute of Technology in Pasadena. He and his wife Elsa returned by ship to Belgium at the end of March. During the voyage they were informed that their cottage was raided by the Nazis and his personal sailboat had been confiscated. Upon landing in Antwerp on 28 March, he immediately went to the German consulate where he turned in his passport and formally renounced his German citizenship. A few years later, the Nazis sold his boat and turned his cottage into an Aryan youth camp. In early April 1933, he learned that the new German government had passed laws barring Jews from holding any official positions, including teaching at universities. A month later, Einstein's works were among those targeted by Nazi book burnings, and Nazi propaganda minister Joseph Goebbels proclaimed, "Jewish intellectualism is dead." Einstein also learned that his name was on a list of assassination targets, with a "$5,000 bounty on his head." One German magazine included him in a list of enemies of the German regime with the phrase, "not yet hanged". He resided in Belgium for some months, before temporarily living in England. In a letter to his friend, physicist Max Born, who also emigrated from Germany and lived in England, Einstein wrote, "... I must confess that the degree of their brutality and cowardice came as something of a surprise." In October 1933 he returned to the U.S. and took up a position at the Institute for Advanced Study (in Princeton, New Jersey), that required his presence for six months each year. He was still undecided on his future (he had offers from European universities, including Oxford), but in 1935 he arrived at the decision to remain permanently in the United States and apply for citizenship. His affiliation with the Institute for Advanced Study would last until his death in 1955. He was one of the four first selected (two of the others being John von Neumann and Kurt Gödel) at the new Institute, where he soon developed a close friendship with Gödel. The two would take long walks together discussing their work. His last assistant was Bruria Kaufman, who later became a physicist. During this period, Einstein tried to develop a unified field theory and to refute the accepted interpretation of quantum physics, both unsuccessfully. Other scientists also fled to America. Among them were Nobel laureates and professors of theoretical physics. With so many other Jewish scientists now forced by circumstances to live in America, often working side by side, Einstein wrote to a friend, "For me the most beautiful thing is to be in contact with a few fine Jews—a few millennia of a civilized past do mean something after all." In another letter he writes, "In my whole life I have never felt so Jewish as now." In 1939, a group of Hungarian scientists that included émigré physicist Leó Szilárd attempted to alert Washington of ongoing Nazi atomic bomb research. The group's warnings were discounted. Einstein and Szilárd, along with other refugees such as Edward Teller and Eugene Wigner, "regarded it as their responsibility to alert Americans to the possibility that German scientists might win the race to build an atomic bomb, and to warn that Hitler would be more than willing to resort to such a weapon. ":630 On July 12, 1939, a few months before the beginning of World War II in Europe, Szilárd and Wigner visited Einstein and they explained the possibility of atomic bombs, to which pacifist Einstein replied: Daran habe ich gar nicht gedacht ("I had not thought of that at all"). Einstein was persuaded to lend his prestige by writing a letter with Szilárd to President Franklin D. Roosevelt to alert him of the possibility. The letter also recommended that the U.S. government pay attention to and become directly involved in uranium research and associated chain reaction research. The letter is believed to be "arguably the key stimulus for the U.S. adoption of serious investigations into nuclear weapons on the eve of the U.S. entry into World War II". In addition to the letter, Einstein used his connections with the Belgian Royal Family and the Belgian queen mother to get access with a personal envoy to the White House's Oval Office. President Roosevelt could not take the risk of allowing Hitler to possess atomic bombs first. As a result of Einstein's letter and his meetings with Roosevelt, the U.S. entered the "race" to develop the bomb, drawing on its "immense material, financial, and scientific resources" to initiate the Manhattan Project. It became the only country to successfully develop an atomic bomb during World War II. For Einstein, "war was a disease ... [and] he called for resistance to war." By signing the letter to Roosevelt he went against his pacifist principles. In 1954, a year before his death, Einstein said to his old friend, Linus Pauling, "I made one great mistake in my life—when I signed the letter to President Roosevelt recommending that atom bombs be made; but there was some justification—the danger that the Germans would make them ..."
What makes the new arrival devoted to this country is the democratic trait among the people. No one humbles himself before another person or class ... American youth has the good fortune not to have its outlook troubled by outworn traditions. Einstein worked in 1943 and 1944 as a $25-per-day consultant to the Research and Development Division of the U.S. Navy's Division of Ordnance. He wrote to Stephen Brunauer, the research chemist who recruited him, that he hoped to avoid visits to Washington, D.C., "knowing that I would be very much molested by snobbish people". As a member of the National Association for the Advancement of Colored People (NAACP) in Princeton who campaigned for the civil rights of African Americans, Einstein corresponded with civil rights activist W. E. B. Du Bois, and in 1946 Einstein called racism America's "worst disease". He later stated, "Race prejudice has unfortunately become an American tradition which is uncritically handed down from one generation to the next. The only remedies are enlightenment and education". During the final stage of his life, Einstein transitioned to a vegetarian lifestyle, arguing that "the vegetarian manner of living by its purely physical effect on the human temperament would most beneficially influence the lot of mankind". On 17 April 1955, Albert Einstein experienced internal bleeding caused by the rupture of an abdominal aortic aneurysm, which had previously been reinforced surgically by Dr. Rudolph Nissen in 1948. He took the draft of a speech he was preparing for a television appearance commemorating the State of Israel's seventh anniversary with him to the hospital, but he did not live long enough to complete it. In his lecture at Einstein's memorial, nuclear physicist Robert Oppenheimer summarized his impression of him as a person: "He was almost wholly without sophistication and wholly without worldliness ... There was always with him a wonderful purity at once childlike and profoundly stubborn." Resolved an unsolved puzzle by suggesting that energy is exchanged only in discrete amounts (quanta). This idea was pivotal to the early development of quantum theory. Explained empirical evidence for the atomic theory, supporting the application of statistical physics. Reconciled Maxwell's equations for electricity and magnetism with the laws of mechanics by introducing major changes to mechanics close to the speed of light, resulting from analysis based on empirical evidence that the speed of light is independent of the motion of the observer. Discredited the concept of a "luminiferous ether." Equivalence of matter and energy, E = mc2 (and by implication, the ability of gravity to "bend" light), the existence of "rest energy", and the basis of nuclear energy. Albert Einstein's first paper submitted in 1900 to Annalen der Physik was on capillary attraction. It was published in 1901 with the title "Folgerungen aus den Capillaritätserscheinungen", which translates as "Conclusions from the capillarity phenomena". Two papers he published in 1902–1903 (thermodynamics) attempted to interpret atomic phenomena from a statistical point of view. These papers were the foundation for the 1905 paper on Brownian motion, which showed that Brownian movement can be construed as firm evidence that molecules exist. His research in 1903 and 1904 was mainly concerned with the effect of finite atomic size on diffusion phenomena. Although the patent office promoted Einstein to Technical Examiner Second Class in 1906, he had not given up on academia. In 1908, he became a Privatdozent at the University of Bern. In "über die Entwicklung unserer Anschauungen über das Wesen und die Konstitution der Strahlung" ("The Development of our Views on the Composition and Essence of Radiation"), on the quantization of light, and in an earlier 1909 paper, Einstein showed that Max Planck's energy quanta must have well-defined momenta and act in some respects as independent, point-like particles. This paper introduced the photon concept (although the name photon was introduced later by Gilbert N. Lewis in 1926) and inspired the notion of wave–particle duality in quantum mechanics. Einstein saw this wave-particle duality in radiation as concrete evidence for his conviction that physics needed a new, unified foundation. Einstein's physical intuition led him to note that Planck's oscillator energies had an incorrect zero point. He modified Planck's hypothesis by stating that the lowest energy state of an oscillator is equal to 1⁄2hf, to half the energy spacing between levels. This argument, which was made in 1913 in collaboration with Otto Stern, was based on the thermodynamics of a diatomic molecule which can split apart into two free atoms. As Albert Einstein later said, the reason for the development of general relativity was that the preference of inertial motions within special relativity was unsatisfactory, while a theory which from the outset prefers no state of motion (even accelerated ones) should appear more satisfactory. Consequently, in 1908 he published an article on acceleration under special relativity. In that article, he argued that free fall is really inertial motion, and that for a freefalling observer the rules of special relativity must apply. This argument is called the Equivalence principle. In the same article, Einstein also predicted the phenomenon of gravitational time dilation. In 1911, Einstein published another article expanding on the 1907 article, in which additional effects such as the deflection of light by massive bodies were predicted. In 1917, Einstein applied the General theory of relativity to model the structure of the universe as a whole. He apprehended that his equations predicted the universe to be either contracting or expanding. He wanted the universe to be eternal and unchanging, but this type of universe is not consistent with relativity. To fix this, Einstein modified the general theory by introducing a new notion, the cosmological constant, which he called ''Lambda''. The purpose of Lambda was to rectify the effects of gravity and allow the whole system to stay balanced. With a positive cosmological constant, the universe could be an eternal static sphere. However, in 1929, Edwin Hubble confirmed that the universe is expanding, Einstein exclaimed after his Mount Wilson visit with Hubble: "If there is no quasi-static world, then away with the cosmological term!" and Einstein supposedly discarded the cosmological constant. Einstein believed a spherical static universe is philosophically preferred, because it would obey Mach's principle. He had shown that general relativity incorporates Mach's principle to a certain extent in frame dragging by gravitomagnetic fields, but he knew that Mach's idea would not work if space goes on forever. In a closed universe, he believed that Mach's principle would hold. Mach's principle has generated much controversy over the years. This is consistent with the now-obsolete Steady State model of cosmology, proposed later in 1949, and with today's modern understanding of dark energy. Einstein was displeased with quantum theory and mechanics (the very theory he helped create), despite its acceptance by other physicists, stating that God "is not playing at dice." Einstein continued to maintain his disbelief in the theory, and attempted unsuccessfully to disprove it until he died at the age of 76. In 1917, at the height of his work on relativity, Einstein published an article in Physikalische Zeitschrift that proposed the possibility of stimulated emission, the physical process that makes possible the maser and the laser. This article showed that the statistics of absorption and emission of light would only be consistent with Planck's distribution law if the emission of light into a mode with n photons would be enhanced statistically compared to the emission of light into an empty mode. This paper was enormously influential in the later development of quantum mechanics, because it was the first paper to show that the statistics of atomic transitions had simple laws. Einstein discovered Louis de Broglie's work, and supported his ideas, which were received skeptically at first. In another major paper from this era, Einstein gave a wave equation for de Broglie waves, which Einstein suggested was the Hamilton–Jacobi equation of mechanics. 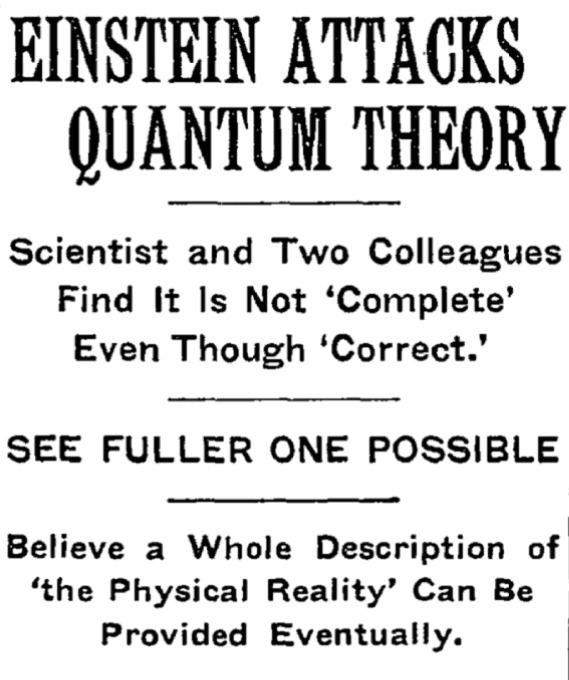 This paper would inspire Schrödinger's work of 1926. Following his research on general relativity, Einstein entered into a series of attempts to generalize his geometric theory of gravitation to include electromagnetism as another aspect of a single entity. In 1950, he described his "unified field theory" in a Scientific American article entitled "On the Generalized Theory of Gravitation". Although he continued to be lauded for his work, Einstein became increasingly isolated in his research, and his efforts were ultimately unsuccessful. In his pursuit of a unification of the fundamental forces, Einstein ignored some mainstream developments in physics, most notably the strong and weak nuclear forces, which were not well understood until many years after his death. Mainstream physics, in turn, largely ignored Einstein's approaches to unification. Einstein's dream of unifying other laws of physics with gravity motivates modern quests for a theory of everything and in particular string theory, where geometrical fields emerge in a unified quantum-mechanical setting. Einstein's political view was in favor of socialism and critical of capitalism, which he detailed in his essays such as "Why Socialism?". Einstein offered to and was called on to give judgments and opinions on matters often unrelated to theoretical physics or mathematics. Einstein's views about religious belief have been collected from interviews and original writings. Einstein developed an appreciation of music at an early age. His mother played the piano reasonably well and wanted her son to learn the violin, not only to instill in him a love of music but also to help him assimilate German culture. According to conductor Leon Botstein, Einstein is said to have begun playing when he was five, but did not enjoy it at that age. When he turned thirteen he discovered the violin sonatas of Mozart. "Einstein fell in love" with Mozart's music, notes Botstein, and learned to play music more willingly. According to Einstein, he taught himself to play without "ever practicing systematically", adding that "Love is a better teacher than a sense of duty." At age seventeen, he was heard by a school examiner in Aarau as he played Beethoven's violin sonatas, the examiner stating afterward that his playing was "remarkable and revealing of 'great insight.'" What struck the examiner, writes Botstein, was that Einstein "displayed a deep love of the music, a quality that was and remains in short supply. Music possessed an unusual meaning for this student." Botstein notes that music assumed a pivotal and permanent role in Einstein's life from that period on. Although the idea of becoming a professional himself was not on his mind at any time, among those with whom Einstein played chamber music were a few professionals, and he performed for private audiences and friends. Chamber music also became a regular part of his social life while living in Bern, Zürich, and Berlin, where he played with Max Planck and his son, among others. In 1931, while engaged in research at the California Institute of Technology, he visited the Zoellner family conservatory in Los Angeles and played some of Beethoven and Mozart's works with members of the Zoellner Quartet, recently retired from two decades of acclaimed touring all across the United States; Einstein later presented the family patriarch with an autographed photograph as a memento. Near the end of his life, when the young Juilliard Quartet visited him in Princeton, he played his violin with them; although they slowed the tempo to accommodate his lesser technical abilities, Botstein notes the quartet was "impressed by Einstein's level of coordination and intonation." While traveling, Einstein wrote daily to his wife Elsa and adopted stepdaughters Margot and Ilse. The letters were included in the papers bequeathed to The Hebrew University. Margot Einstein permitted the personal letters to be made available to the public, but requested that it not be done until twenty years after her death (she died in 1986). Barbara Wolff, of The Hebrew University's Albert Einstein Archives, told the BBC that there are about 3,500 pages of private correspondence written between 1912 and 1955.